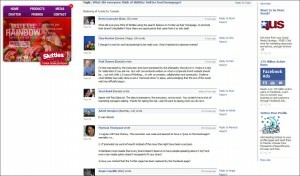 Experimenting in social media and web 2.0 can be a really fun thing to do. That is if you are an individual working on testing out some theories, or a small company that is nimble enough to adjust, make quick changes and adapt. Where experimenting with social media crosses the line of fun into dangerous territory is with brands who think that it’s the newest, hippest, greatest “thing” they should be doing, “just because”. That “Just Because” reasoning is probably the most dangerous reason out there. Those are just a few of the “Just Because” reasons you hear. These are really dangerous reasons to start “playing” with social media, especially if you have never ventured into the area before. There are key things you need to be prepared for if you enter into this space, one thing is that it takes time. So many companies are coming into this space thinking if they slap up a Twitter stream, or a Facebook page, that’s social media. Sorry to burst the bubble here, that’s as far from social media as a company can get. That’s just more of the same old advertising consumers are sick of. I wrote about Skittles not “getting it” with their Twitter Stream & social media when it launched on Monday. Word comes from Media Post that they pulled their Twitter campaign. Now Skittles is showing a facebook page. Again, this isn’t social media. These are just flashy billboards, ones that after a while can even hurt the Skittles brand. Experimenting with Social Media can come at a cost, too, especially when you are dabbling with something that is totally out of the spectrum of your target market. Lets take for example Skittles again. Skittles is a candy. Who is candy marketed too? Kids and perhaps teens. Now with that in mind, what do you think is on all the packaging for Skittles? Their URL (see the photos below I took of a Halloween style candy handout and the bag those came in)! What do you think kids are going to type into their computer if they are eating Skittles as they surf the internet? http://www.Skittles.com. Do you think Skittles.com is going to be stopped by parental filters? Not before Monday it wouldn’t have been. 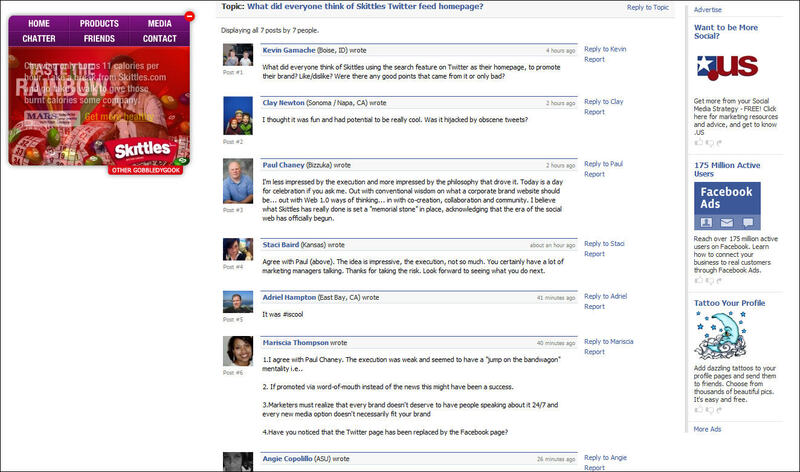 Now, let me pose this question – are these kids and teens using Twitter by the droves? No, they aren’t – you find them on Bebo. So your major demographic is kids, but you are using a social media piece of technology not used by your target demographic, why? Ummm “just because“, it’s cool and it will get us buzz! Will it get more kids or parents to buy your candy. Nope. See the danger of experimenting with social media, now? 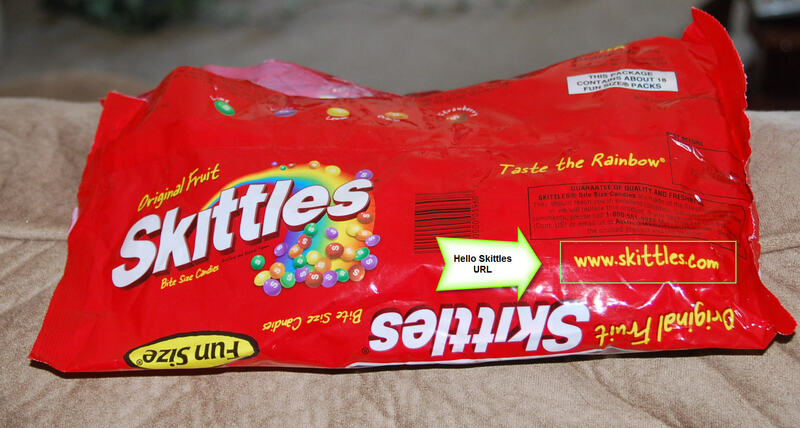 This entry was posted in Offline Marketing, Online Marketing, Social Media, Web 2.0, Word of Mouth Marketing and tagged experimenting with social media, skittles, skittles facebook, skittles social media, skittles twitter, skittles youtube by Liana "Li" Evans. Bookmark the permalink. ‘I don’t think Skittles taste good. What really matters for Skittles is that they move toward a goal. It could be to boost product sales for 7 days — which they probably will. It could be to be more top of mind next to their biggest competitors; in other words, be in the consideration set more often. 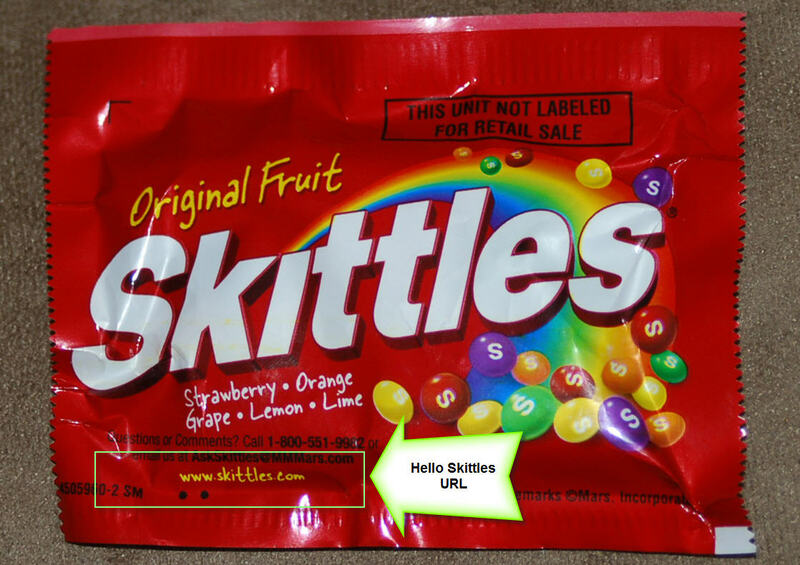 It could be to expand their product user base — get those who have never tried Skittles to do so. Maybe they wanted to improve excitement around the Skittles brand. This will probably give Skittles a short term spike. When the dust settles, will they be better off than before? I don’t know the answers, but Mars is definitely learning a lot with this exercise and using one of its more edgier brands to do so. The long-term payoff will be tremendous. When I checked out the Facebook page, Skittles had yet to reply to anything on that page. So maybe now they are learning after getting hit in the head with this? But I have to disagree with you, I don’t believe much of this impacts buying Skittles – as Social Media outlets like Twitter, YouTube, Facebook, & Flickr are NOT used by kids who buy their candy. Had my sister look at this on Tuesday w/o giving her any information. When she saw the page w/ the Twitter replies and some of them quite offense, she said – “that’s it, my kid isn’t typing in THAT site anymore”. She has a 6 year old who is learning computers now in school. I’m sure she’s not alone in that thought, and won’t be the last. and that’s who their audience is – not us Social Media users. Thanks for your reply Li. My daughter (age 12) and her friends are all using Facebook. They’ve just started, but are actively using it. So, I know they use Facebook. They would use YouTube more if we hadn’t blocked it because of trust infringement by our 15 year old. Twitter, not so much. I’m not an expert on confections — I don’t know what candy types appeal to different segments and why. But if I were going to expand my target audience, I would go where the new audience is. Again, I go back to goals. Maybe Skittles isn’t targeting the tweeners with this. Maybe they are looking to the less-monitored, more socially engaged teens and older. And I would agree, your sister and I are not the Skittles target. But I bet this is all the buzz on college campuses and perhaps high schools as well. And I bet Skittles is moving more product. nice explanation. your analysis is also quite clear. it can be a material for discussion. in my opinion, I agree with you. it will be very dangerous to share a brand in the internet.